U-Stor-It has been in the business of safely packing and storing peoples belongings for 39 years, so if you’re looking for some self-storage tips in Charlottesville, VA, we are the team with whom you need to speak! U-Stor-It does not insure your belongings, nor are they responsible for any damage to your goods while being stored. However, your homeowner’s or renter’s insurance policy may cover them. Check with your insurance company or agent. If your belongings are uninsured, we can provide self-storage insurance company information, or you can contact them directly at (800) 544-6464 or online at www.tenantone.com. Plan ahead. Think about what you have to store, and rent the proper size unit for your needs. Check our Pricing page for information on roughly how much each size unit will hold. 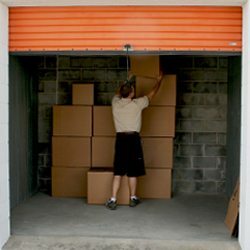 Begin storing items in the rear of the unit by placing the heaviest items on the floor. Remove legs from tables, stack chairs, and stand your couch on end to conserve space. Place lightweight boxes on top of the heavier items. Remember, all our affordable storage units have a minimum 10′ high ceiling, so take advantage of the vertical space. Use household furniture and appliances as storage by placing items inside dresser drawers or washers and dryers. Caution: Be sure to place a piece of cardboard in the door of any appliance to keep it cracked for air circulation-that way mildew and mold don’t become a problem. Remove fuel from any gas-propelled mowers, weed eaters, or barbecues. Put any items you may need to reach quickly in the front of the unit. Make sure you padlock your unit securely before leaving the U-STOR-IT facility. Make sure you have plenty of different-sized boxes, filler (peanuts, newsprint, tissue paper), markers and tape before you start to pack. If you are storing furniture or artwork, use blankets or furniture covers between items to prevent scratching or other damage during moving and deposit to your storage units. Use large boxes to store lightweight items like sheets, clothes, and shoes. Use medium boxes to store bathroom and kitchen items. Use small boxes to store books, trinkets, and smaller items. Individually wrap each item inside a box to protect against damage. Close lids flat and securely tape them shut. Clearly label each box. If a box contains numerous small items, consider taping a list of contents to the top of the box. The key is to pack carefully. Tape boxes securely and clearly label each box. Remember, no box should be too heavy to lift easily. Contact us if you require information on unit rates, unit sizes, or further packing and self-storage tips from our experts!